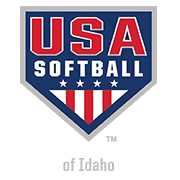 USA Softball of Idaho provides youth with an opportunity to participate in organized activities that afford them competition that is safety oriented, not overly controlled, and most of all...FUN! USA Softball of Idaho, like the national program, promotes good sportsmanship, developing citizenship and character building. UsaI had over 2000 registered teams in 2016. There were 12 Championship Tournaments and 100 invitationals in Idaho this past year. Participate in the Pitch, Hit and Run contest. Entry is FREE, and you could win a trip to the MLB All-Star game. If you are registering your team, make sure you check the Head Coach, Team Administrator and Manager roles. There have been issues, but if the players on your team were reigistered last year, and they register this year, they will be covered by insurance. Please bear with us as we get the issues worked out. All the Idaho State Junior Olympic championships will be help Junu 29 - July 1 in the Treasure Valley. Click here for more information. There is a state and national staff to assist by providing a myriad of services including numerous publications and brochures, free technical films, coaching and umpire schools, information on how to organize leagues and conduct tournaments. Liability insurance is available for every softball field in your town.